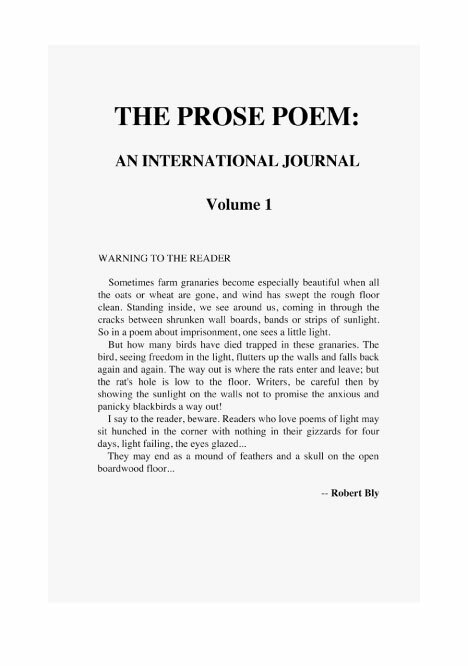 • Physical dimensions of The Best of The Prose Poem: An International Journal anthology in cm: 15 x 22.5 x 2. • Weight of anthology in grams: 419. • Total # of words in anthology: 85,667. • Total # of words devoted to actual prose poems: 69,986. • Rain Taxi ’s length-limit for review of Best of The P.P. : 1,000 words. • Form of r~eview: indexical/statistical/schematic. • Official name of this new, transgeneric critical form: the Indexical Book Review. • Tactical reason for review form: The words preceding each item’s colon technically constitute neither subjective complement nor appositive nor really any recognized grammatical unit at all; hence none of these antecolonic words should count against R.T.’s rigid 1,000-word limit.